A varied menu served daily from 12.00 - 14.00 / 18.30 - 21.00 and homemade sunday lunch with a variety of bar meals served from 12.00 - 15.00 every Sunday. Live artist every saturday and general knowledge quiz every sunday. Beer garden to front and smoking shelter to rear. Disabled access and toilet and also baby changing facilities. Best Community Pub in Rhondda for last three years. Also Regional Publican of the Year 2016 with Punch Taverns. Our menu is designed to provide something for everyone. 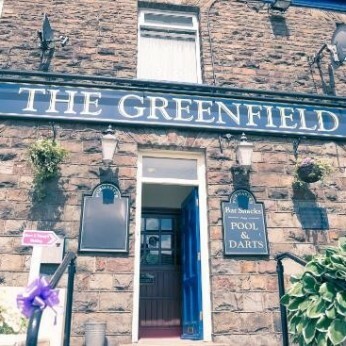 Whether you are looking for a light bite to accompany your drink, a coffee and cake or in need of a hearty meal The Greenfield is all your need. Our steaks are cooked to order and simply melt in your mouth, build your own burger to your taste or enjoy the our homemade specialities. Also we have a new childrens menu.